Motorola Droid 2 Cases Rock Up at Best Buy, But Where's the Phone? 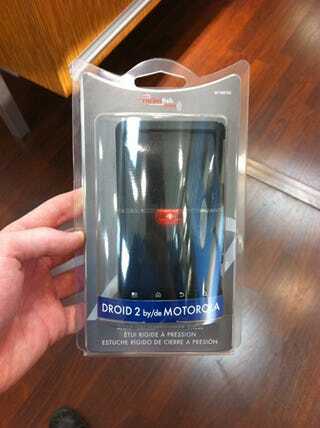 An employee at Best Buy Mobile spotted these suspicious cases in a new delivery, and whaddya know—they're emblazoned with the product name of Motorola's much-hyped Droid 2. Rocketfish makes accessories for phones, gaming products, and home theater and audio kit, so it's pretty likely that if they've pushed "go" on the delivery of some new cases for an upcoming phone they've been privy to receiving the measurements of, then there's a good chance that slide-out-qwerty phone will be on shelves soon. Just in case you were still wondering about that touted August 12th on-sale date.